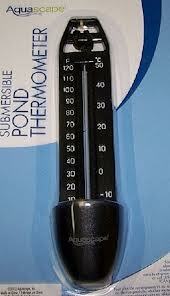 Use of a pond thermometer will help you know when to strat and stop feeding your fish. If water temperature in the fall is below 55 degrees, stop feeding until the pond water warms up to 55 degrees in the spring. Fish can not metabilize food when the water temperature is below 50 degrees. 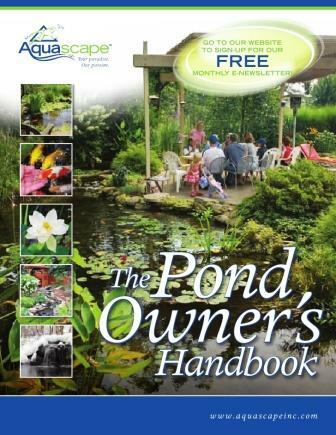 If you feed them during the colder months, you will add unnecessary nutrients to the water that will pollute your pond. You could also hurt or kill your fish as well! If the water temperature falls below 60 degrees, it is also a good time to add Aquascapes AquaClearer Extreeme Cold Water Liquid benificial bacteria to help breakdown any leftover organic debris. 74000 Monitor pond temperature throughout the year to aid in adjusting fish feeding schedule and water treatment applications during seasonal changes.